Even good technology turns evil in the wrong hands – or paws. Cyborg Labbit Nemisis is a dark rogue non-stop smorker. 7-inch vinyl with two ends that always glow, this Chuckboy upgrade to the Kozik classic is stronger, faster, and smorkier than ever before. Only 1,000 Labbits went hybrid and they hit the streets March 14 at Kidrobot stores, kidrobot.com, and select retailers worldwide for $60 US (£48 UK, €55.70 EU). 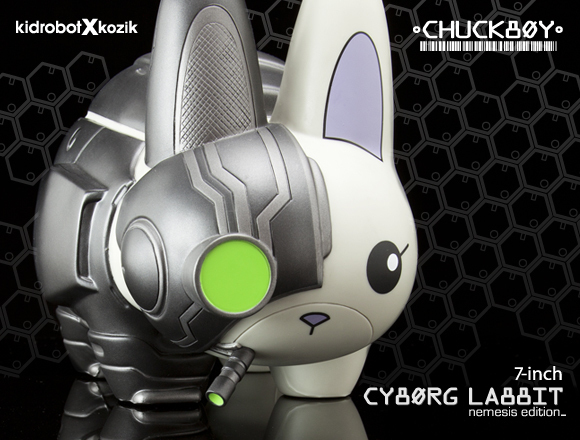 The post Product Preview- Cyborg Labbit 7-Inch Nemesis Edition by Kozik x Chuckboy appeared first on Kidrobot Blog.